Scientific partners: BRGM Orléans, France (porteur) ; Global Climate Forum (GCF), Berlin, Germany ; Mediterranean Institute for Advanced Studies (IMEDEA), University of the Balearic Islands, Spain ; Institute for Marine and Atmospheric Research (IMAU), Utrecht, Netherlands ; Créocéan, La Rochelle, France. Global to regional coastal climate service (S.1, WP-1), addressing the needs of major companies, international organizations and governments to have globally consistent information on sea-level rise, its impacts and adaptation pathways for long-term locational planning, climate policy making and financing adaptation and loss & damages. Regional to local coastal climate services addressing the needs of planners and policy makers for local tailored sea-level projections, impact and adaptation information useful for long-term development, infrastructure and land-use planning for two high impact territories: the Maldives (S.2, WP-2) and French Polynesia (S.3, WP-3). LIENSs is mainly involved in WP 2 (Maldives) et WP 3 (French Polynesia). In WP2, LIENSs contributes to assessing climate change biophysical impacts. Additionally, LIENSs coordinates WP3, in close collaboration with BRGM and Créocéan (PhD thesis of Heitea TEROROTUA). Terorotua H., Duvat V., et al., en prep. 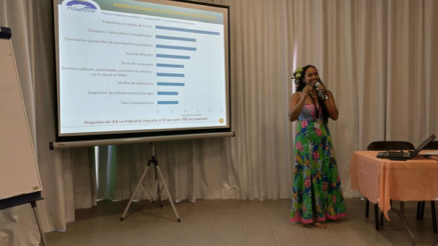 Climate change perception by institutional actors in French Polynesia. Terorotua H., Duvat V., Le Cozannet G., 2018. 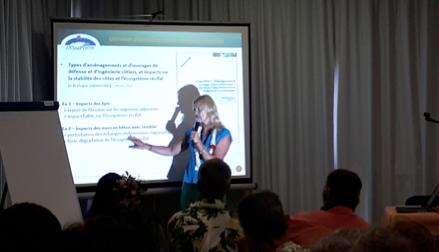 Assessing adaptation to clilate change needs in French Polynesia. Workshop Dealing with climate change on small islands: toward effective and sustainable adaptation? Hannover, Germany, 25-27 July 2018.